The reality, though, is far different. He’s got a wife, but their problems are bigger than he can even imagine. And he’s written a novel, but the manuscript he’s slaved over for years is currently hidden in his desk drawer while his father, an actual famous writer, just won the Pulitzer Prize for Fiction. His career, such that it is, involves mind-numbing corporate buzzwords, his pretentious arch nemesis Gregory, and a hopeless, completely inappropriate crush on his favorite coworker. Oh . . . and his dog, according to the vet, is suffering from acute anxiety. I don't think you would call this my normal fare. I certainly didn't think so when I read the first chapter which is all about the erectile dysfunction of the main character, Tom Violet. Once I got used to this as the opening of the novel and the focus changed a little, I enjoyed the voice and humour of Tom Violet. Tom is in his mid-thirties and quite frankly his life is falling apart. He hates his job, he and his wife are supposedly trying for another child (but that can't really happen when you can't get it up), he has a bit of a crush on a young coworker and he is riddled with self doubt over the book that he has just finished which may be a bit understandable given that his famous novelist father, Curtis Violet, has just won a Pulitzer Prize. One of the things that was quite interesting to me about this book is that this seemed a little bit like a coming of age novel, or more precisely a coming of maturity. Tom cruises through his normal work day, doing as little work as possible, but taking every opportunity he got to irritate his arch enemy Greg (who prefers to be called Gregory). One of the highlights of this book were the series of notes that are sent to HR about Tom. They initially start with Gregory but eventually other people in his life are writing to HR to complain about Tom as well.. As someone who works in a HR department, I can't say that I have seen complaints quite like those in the book, but I have seen some pretty odd ones over the years. Here's an example of one of the notes to HR from page 39. Tom Violet insists on smiling and saying hello to me every time he sees me, even in the men's room. However, I know that these sentiments are not sincere, and only succeed in undermining me in front of my team and fellow employees. Despite the Global Financial Crisis casting its long shadow and causing anxiety for all of his coworkers, Tom performs a stunt which basically guarantees his career in copy writing is over. Tom is left to put together the pieces of his life - relationships, future and more. He needs to figure out what he wants to do for a living, whether he wants to save his marriage, what to do with the novel he has written, and how to finally face up to living in the shadow of his charismatic and successful father. Ultimately, he has to decide what is important to him. I really enjoyed the portrayal of the Violet family. Anna knows that everything is not as it should be but doesn't know how to reach her husband. Both of Tom's parents are having marital issues with their respective partners, and I loved the way that the two fathers in Tom's life came together. Both have their own issues to deal with but the bond with Tom was definitely important and strong. 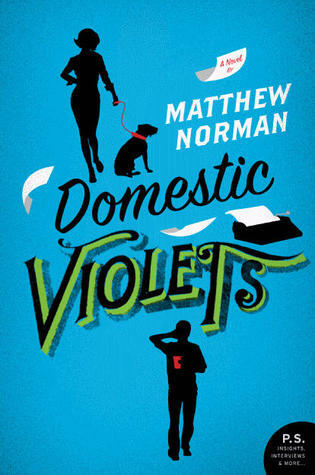 With a full and varied cast of supporting characters that each are on their own emotional journeys but together form a strong narrative on modern life, Domestic Violets is in turns funny and serious, showing the strengths and weaknesses of the characters in such a way that will have you both laughing at them and giving the reader something to ponder as well. This was a different read for me, but one I enjoyed. I will be keeping my eye out for more from Matthew Norman in the future. Thanks to Netgalley for an egalley of this book. I'm really glad you liked this one. And your description of it as "more precisely a coming of maturity" novel is perfect. Isn't it great when you step outside of your typical reading zone and discover a great book? I love a good coming of age or "coming of maturity" novel as you so eloquently put it and I'm definitely looking forward to reading this book after reading your well written review. I also love the 'coming of maturity' designation! I have this one sitting on my shelf waiting to be read. The reviews I've seen are mostly positive, so I'm anxious to read it! Thanks for sharing your thoughts. Man this is like THE book on my feed reader today! I’m about to start it so it’s great get everyone’s views before I dive in. I am reading this one right now, and have to say that the interactions between Tom and Gregory are hilarious. It's a really great read, and has a lot of cynical humor in it, which I also like. This is a great review, and I am so glad that you really enjoyed it, even though it's not your typical reading fare! Coming of Maturity - that's perfect! I don't think I'd heard of this one before but I like how you've described and it sounds like a fun read. That sounds funny, I think I'd like this book. I downloaded a copy of this one too mainly because it sounded way outside my normal reads. Glad that you enjoyed it...now I'm looking forward to reading it! I have this book to read, too. I am looking forward to it!